The top teeth have already improved. The upper lateral incisor (the pink bracket to the right of the upper front tooth in purple) has started moving back into the proper place. 1) Ceramic bonding glue stains and can be seen behind the bracket. There isn't anything you can do about it. 2) The clear or light-colored ligatures (rubber bands that go around the brackets) change color and don't do anything to hide the ceramic brackets once stained by coffee, tea, soda, tomato sauce, curry, etc. In fact, they can look downright gross if you stain them. 3) Ceramic brackets are larger and my bottom teeth are tiny. 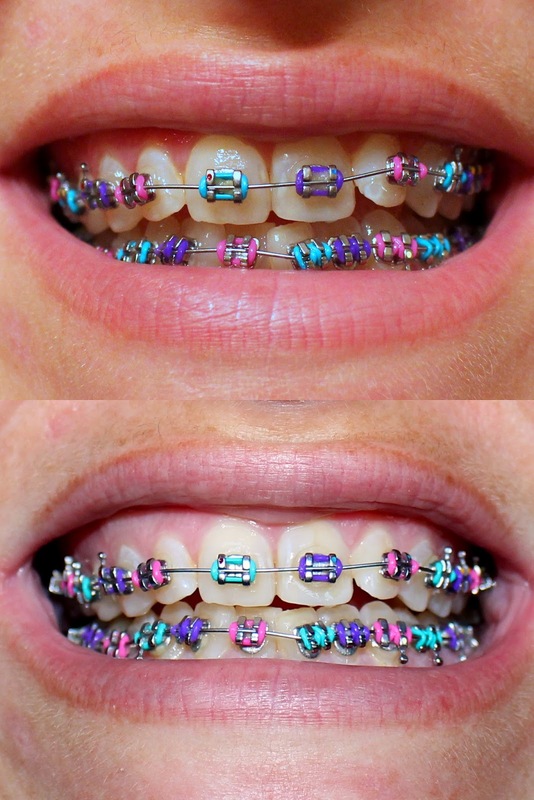 Considering how hard it is to get my lips over my small metal brackets, I can't imagine doing that. 4) The removal of ceramics can be difficult. The bonding material is stronger and can pull the enamel off of your teeth. That is a risk I am not willing to take. I have a small amount of bonding on the surface of one of my top front teeth and the thought of getting a ceramic bracket pulled off of it scares me. 5) Ceramic brackets are brittle and they can break. Enough said. 6) Metal is stronger and can work a little bit faster than ceramic. Some people pay more for ceramic but my ortho charges the same either way. I really wish that the ceramics didn't have so many cons because I really wanted them, but I am happy with the metal. Since I have metal, it was easy for me to go with colorful ligatures since there is no way to hide the fact that I am in braces. The only bad thing is that I cannot eat properly. My molars are so sore that biting isn't something that I can do as of yet. It has been weird eating soft foods all the time. Oh well, it will all be worth it in the end. Heck, I was having a hard time eating before braces because my molars had just enough space between them that they caught food every time I ate. It was terribly painful and the main reason that I opted for braces in the first place.